Cherry Mobile silently released their series of Android phones. After we spotted their first LTE phone W900 here they go again with another surprise for us all. 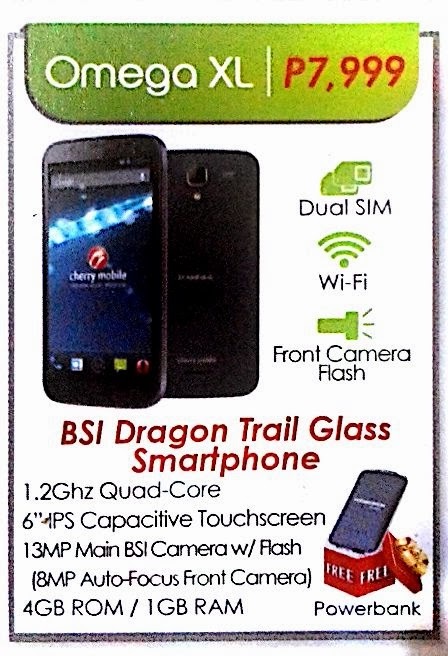 Fresh from their Christmas promo flyer a handset dubbed as Cherry Mobile Omega XL spotted with a huge IPS 6-inch screen display. Only few details were indicated that includes key specifications, price and freebie. The name speaks itself. It has a huge 6.0 inch screen that makes easier for you to use its multi touch feature and UI browsing. Dragon Trail Glass is also added flavor with Cherry Mobile Omega XL. A screen glass that protects your phone from scratches making it worry free putting on your pocket with coins and sharp objects that may cause scratch on your phone screen. Regarding its resolution, we still have no idea about it but for sure it sports a IPS screen. With that feature the display will surely renders you good quality colors in every angles and even outdoor viewing with the presence of sun light. Almost all of us want a decent camera specs on our phone. Cherry Mobile Omega XL won’t fail you on this with its 13 megapixels rear camera and 8 megapixels front facing. I’m sure everyone use this features to capture moments and for social networking. If you’re on Facebook, Instagram and other photo sharing sites you can fully take advantage of the camera on uploading quality images. It has also a BSI (Backside illumination) sensor that helps take good shots in low light scene. Its front camera also has autofocus feature for your selfies and me time. Quad core processor on this Omega XL is big deal feature knowing the price indicated. We usually look on phone processor as this mainly determine how it handles all the tasks you throw on it. The 1.2GHz quad is enough for multi tasking and light-to-heavy games. It has 1GB RAM amount and 4GB on internal storage that you can expand with the use of external microSD card. You can have this phablet for only 7999 pesos only and you’ll also get a free power bank that you can use in case your battery drains while you’re on travel or no power socket available. This is another affordable Android phone to watch for from Cherry Mobile. Aside from unmentioned features and specs you can say that it’s worth for the price. Hopefully this comes on HD display and higher battery power.